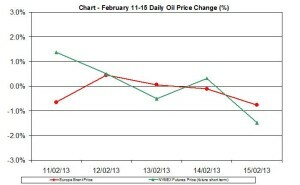 Crude oil price changed direction and fell during last week. The U.S stockpiles slightly rose according to the recent EIA report. 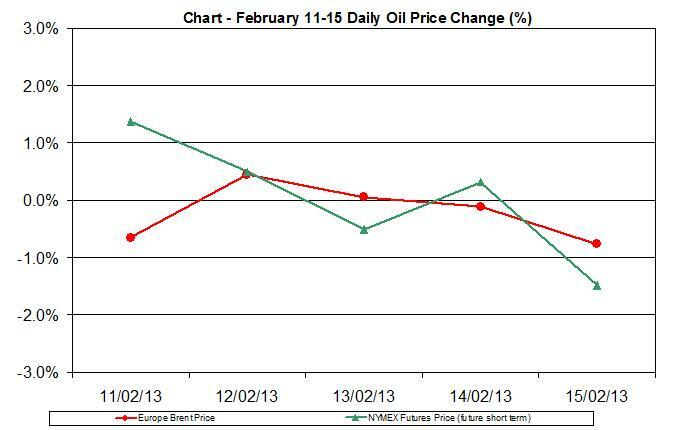 The difference between Brent and WTI has widened to a range between $19 and $23 during last week. Brent decreased by 1.04% during the week; WTI oil edged up by 0.15%. As a result, the gap between Brent and WTI reached $21.8/b on Friday. NYMEX Oil Future (WTI) inched up during last week by 0.15%; its weekly average rate also increased by 0.78% to $96.94 per barrel, compared with last week’s $96.2 per barrel. The average daily percent change of oil price (WTI) was 0.03%. 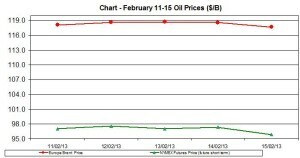 NYMEX Oil Future (short term delivery) reached $95.86/b by Friday, February 15th. Europe Brent oil, on the other hand, declined during the week by 1.04%, but the average price rose by 1.16% compared with last week’s average. The difference between Brent and WTI was at the range between $21 and $22 during the week; its average premium reached $21.7; it finished the week at $21.8. The first chart presents the changes of WTI and Brent oil during last week: WTI oil inched down while Brent oil slightly declined during the week. For the week ending on February 8th, U.S. Petroleum and crude oil stockpiles changed direction and fell by 7.2 million barrels and reached 1,791.9 million barrels. The current oil stockpiles are still higher than the quota from year: the current crude oil stockpiles are 40.3 million barrels above oil stockpiles for the same week in 2012. U.S. Ending Stocks of crude oil on the other hand increased by 0.7 million barrels and reached 1,068.2 million barrels. The U.S. Ending Stocks of Total Gasoline declined by 0.34% compared with last week’s stocks; it reached 233.2 million barrels. 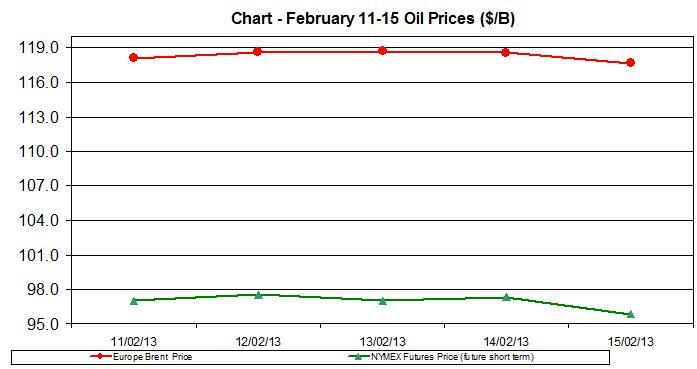 During recent years the lagged linear correlation between WTI oil price and current oil stockpiles was -0.20. This mid-weak correlation suggests, assuming all things being equal, the rates of oil may rise next week.